How have prominent rent-to-buy figures responded to challenges? The rent-to-buy industry has faced some challenges over the past few years, including negative media coverage, attention from regulators and a series of prosecutions. This post contains a number of responses to these negative events by Rick Otton and his lawyer Anthony Cordato. Rick Otton is the best known promoter of rent-to-buy strategies through his ‘bootcamps’ and mentor programs. Otton claims he has taught more than 30,000 students over 13 years. Anthony Cordato is Otton’s lawyer, and has apparently been appearing at Otton’s ‘bootcamps’ for many years. He refers to himself as a “vendor finance lawyer”. The responses in this post have been sourced from publicly accessible websites – therefore it is possible that they don’t reflect the complete responses by the individuals. However, even if the issues are addressed more seriously in private, not everyone will have access to those private responses, including a number of past students who are doing these deals. Responses from both men appear to me to be somewhat obtuse, with almost no acknowledgment that there are problems with strategies taught at the seminars. See ACCC Media Release here The ACCC alleges that a number of claims made by Otton are misleading, including that people who use his strategies can ‘buy a house for $1”, “start making profits immediately”, “create passive income streams through property and quit their jobs” and that Otton has been successful financially in implementing the System and/or the Strategies in Australia. In Feb 2016 Otton responded on a UK forum, to references made on that forum about the ACCC action against him in Australia. I’d like to clarify some comments that have been made on this forum. Currently, I am in mediation regarding the referenced case. From an international perspective, lease options are a property tool that has been around for a long time. A lease option (more formally Lease With the Option to Purchase) is a type of contract used in both residential and commercial real estate. In a lease-option, a property owner and tenant agree that, at the end of a specified rental period for a given property, the renter has the option of purchasing the property. Used correctly, lease options can benefit buyers and sellers. I believe and teach it is important to have solicitors represent buyers and sellers in property transactions. When choosing any property investing strategy, it is a personal choice which strategy an investor chooses to use. Having taught many investors over the years, it is my belief that once taught it is up to each individual to be personally responsible to conduct themselves in an appropriate manner. If anyone has any questions, I’m happy to answer them. Please email me at support@rickotton.com. There ACCC makes limited reference to ‘lease options’, including them as one of six strategies that make up Otton’s “system”. Otton’s initial media release appears to attempt to address part of the ACCC’s claim, but the more recent response seems to miss the relevant points. Rick Otton, and two of his companies, entered into an enforceable undertaking (EU) with Department of Commerce WA, agreeing not to promote his schemes and seminars in WA for 2 years, and not to make particular claims (including on his websites) unless specific warnings were published. One of the required warnings was that it may be illegal to arrange real estate transactions in WA without a real estate agents licence. Otton didn’t admit any breaches of legislation in agreeing to the EU. 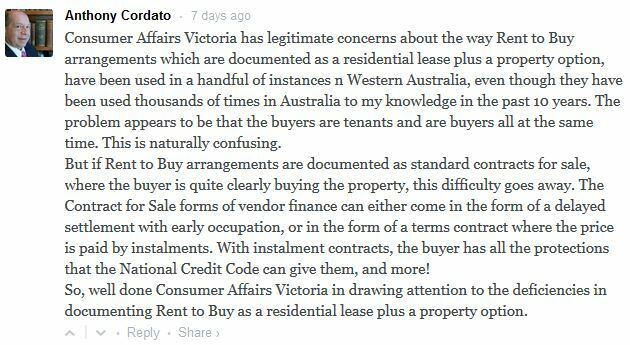 On 19/11/13 Otton provided a further response on the Australian Property Forum. Read his full response here. Otton says he is providing some “more accurate information about WA”. He explains that WA “some time ago passed [a law] that people need a real estate license in order buy, sell or trade a property option”. He says that he “flew to WA and had an informal chat with the Commissioner re this change” because he was concerned about the impact on property developers and others. He says that “many in the legal fraternity” were “surprised” because the law was “never debated or challenged”. Otton says that Commerce WA was concerned that people who didn’t understand the strategies may be misled, and that he agreed to a request by Commerce WA that the book be withdrawn for 2 years “so everybody could get up to speed”. He proceeds to talk about the history of his strategies and to say “to question anything and or challenge the status quo means you will have supporters on one side and traditionalists who challenge you on the other, as change is threatening and uncomfortable”. Some people may be satisfied with this explanation, but I think that under the guise of providing “accurate information” Otton says very little that genuinely explains the circumstances around his acceptance of the EU, adding a lot of “puffery” about himself, his book and his strategies. According to Commerce WA, EUs are an option for “significant matters” and are used for dealing with breaches of fair trading legislation. Commerce WA has only entered into 14 EUs in the last 3 years. While each situation can be different, businesses that accept an EU usually do so because they otherwise face legal action by the regulator. Otton’s response appears to suggest that the EU was purely voluntary, just so everyone can “get up to speed”. His story about the law “change”, including the “legal fraternity” being surprised about the law is curious. The requirement to hold a real estate agents licence in WA includes those who act as an agent in relation to “an option to enter into a real estate transaction”, and it appears that this has been the law since at least 1978. While I initially thought Otton was talking about a more recent change, I now believe that the term “some time ago” may mean 35 years ago. It is also unclear whether Otton’s flight to WA to “have an informal chat with the Commissioner re this change” was a separate meeting or whether he raised this issue about the law during negotiation of the EU. While legislation in (at least) some other states doesn’t specifically use the term “option”, I believe it is likely that the types of vendor finance transactions Otton teaches would require an estate agents licence outside WA – and those in the industry appear to now accept this. Two past students of Otton’s were prosecuted in the Supreme Court in WA for arranging rent-to-buy deals without holding an estate agents licence. They were also prosecuted for a number of misleading and deceptive statements including “Buy my home”, “No banks home”, “$538 per week” and “We can buy your house fast”. Read more here or read the full decision. Photos from Otton seminars show students on stage holding similar signs, including “No banks” and “Buy my house”. A sign in his book says “We Buy Houses Fast”. Otton is the founder of “We Buy Houses Pty Ltd”. The court found representations that the Susilos “buy houses” were misleading because they didn’t actually buy houses. While it is likely that Otton students also attend other seminars, and a prosecution does not necessarily mean Otton’s teaching that is at fault, Otton was clearly reluctant to admit that he knew the Susilos. Here is part of his evasive response to Jennifer Duke from Property Observer when she asked when and how he met the Susilos. (full article here). “The industry has and is growing rapidly and I sense only now Government is acknowledging that and is providing some clarity which is a good thing so everybody can move forward”. And here is a longer response from Otton prior to the end of the case. I think his outline of the legal change in WA is nonsense, but I’d welcome someone correcting me if I’m wrong. While the court found the various statements misleading in the Susilos’ particular circumstances, the strategies used by the Susilos appear to be similar to those taught by Otton. Give that the risks faced by past students who used these terms was made clear by the Court’s decision, Otton’s responses appear flippant. His suggestion that there are ‘positive’ aspects of the case, by claiming that it showed Government acknowledgment of growth of the industry and it provided clarity, illustrates an extreme example of the Pollyanna principle! Otton’s claim that the judge agreed with “our side on many issues raised by the commissioner of WA” isn’t supported by details given in the court decision. Anthony Cordato wrote an article about two court cases in WA, one being the Susilo case. Cordato didn’t declare his relationship with Otton, who appears to have taught some of the strategies that became unstuck– or the fact that he attended and presented at Otton seminars for some years. Of course he is under no obligation to mention this, but it could have allowed readers to understand that Cordato is not purely an independent observer. Cordato’s article appears to downplay the significance of this case, noting at a number of points that the Susilos could have simply avoided misleading statements by making minor changes to the claims they made. I think this response might be more acceptable had there been only one or two minor misrepresentations. In fact, the misrepresentations related to a number of different aspects of the transactions, and were numerous. It is true, as Cordato points out, that the Commissioner for Consumer Affairs did not challenge the legality of the rent to buy/vendor finance arrangements, however Codato says this is “because [these arrangements] are legal”. If Cordato had more information about Commerce WA’s reasons for the way they ran this case, it would have been useful if he had explained this. There are a range of reasons why a regulator might not challenge the legality of the contracts. As I discuss in this post, even if a contract is illegal or void, or can be challenged as an unjust contract, it is often only a party to the contract that can challenge the legality of the contract. There are many factors that can lead to a contract being void, or give one party the right to challenge the enforceability of a contract, which don’t raise a breach of the law that can be prosecuted by a regulator. The fact that a regulator doesn’t challenge the validity of a particular contract doesn’t confirm anything about the legality – or otherwise – of the contract. A number of regulators have issued warnings about rent-to-buy, but I include this one because Anthony Cordato posted an interesting comment. The warning is here. Anthony Cordato includes significant information on his website about using a residential lease and option to purchase. For some reason, he appears to have decided recently that this isn’t the best strategy to use. While he congratulates CAV in “drawing attention to the deficiencies” in documenting rent to buy in this way, he hasn’t mentioned what he believes are the deficiencies in his comment, or on his website. Since March 2015, when the ACCC issued legal action against Otton in Australia, Otton has been running seminars in the UK. In November 2015, this was mentioned on the Property Tribes Forum. Some members expressed surprise and expressed some surprise that this had stayed ‘under the radar’ in the UK and questioning some of his strategies. Once again, Otton fails to address the issues and ‘bulks out’ the response with a Wikipedia definition. This entry was posted in Rick Otton and tagged Commerce WA v Susilo, lease options, rent to buy, rent to own, Rick Otton, vendor terms. Bookmark the permalink.